The St. Peter Catholic Community, nourished by the sacraments of the church and God's grace, welcome all who strive to follow Christ. We are committed to joyfully living the gospel through worship, prayer, education, service and stewardship. St. Peter Catholic School in Monument offers preschool thru 8th grade and provides superior academics and faith formation in a safe, caring community where each child is accepted and respected. Our diocese will take up a collection for the Catholic Home Missions Appeal to support the neediest dioceses in the United States. This appeal makes the most basic faith programs possible and shares the gospel message with our brothers and sisters in dioceses including ours where Church communities are scattered and struggling. Bishop Sheridan asks that you prayerfully consider how you can support the appeal this year. To learn more about the appeal and those who benefit from it, visit www.usccb.org/home-missions.Thank you for strengthening the Church at home. If you have not done so already, please return your Rice Bowl to the gathering area as soon as possible. Thank you! All adult volunteers are invited to Jaeger Hall on Friday, May 17, 5-7pm, as we recognize parishioners and school volunteers who have given of their time and talent this past year in the school and/or parish. Special recognition will be given to outstanding volunteers who go above and beyond with their time and talents. If you are an adult volunteer and plan to attend, an RSVP is requested by April 30 via the Sign-Up Genius link or ministry.volunteer@petertherock.org. Join Fr. Gregory, St. Peter team captain, at Memorial Park for Life Network’s largest fundraiser. Donate or register to be a walker/runner in the gathering area after Masses on the weekends of May 18 & 19 and May 25 & 26. To pre-register or begin your own fundraising page for the WALK for LIFE, visit http://www.walkforlife.com. For more information, contact Stephanie Kemp (stephanierkemp@gmail.com or 719-481-4355). Returning God's Gifts 2019 - THANK YOU! Many thanks to everyone who contributed and helped St. Peter reach our goal. The Returning God’s Gifts (RGG) Annual Appeal is a diocesan-wide effort that supports the pastoral services and ministries of the Catholic Church in the Diocese of Colorado Springs. To learn more about Returning God's Gifts or donate, click here. Did you know that 345 corporations have stopped funding Planned Parenthood, the nation's largest abortion provider? As a result of the prayers and dedication of tens of thousands of pro-life people, Planned Parenthood has been denied more than $41.5 million in corporate support. Why be a part of the Corporate Funding Project? Because it matters! Here is a beginning list of corporate sponsors and some of the items/name brands they are most known for: ADOBE (computer software- Acrobat, Flash, Macromedia Products); ADVANCE (computer, entertainment, internet, publishing-Architectural Digest, Bon Appetit, Brides, Glamour, Golf Digest, Vanity Fair, Vogue and many more); ALPHABET (advertising/marketing, communications/financial/ medical devices/research, publishing); AMERIPRISE (financial/insurance); ARTHUR MURRAY (dance education, entertainment, personal care). These are nonprofits 'behaving badly': ALLIANCE FOR REGENERATIVE MEDICINE; ALS ASSOCIATION; ALZHEIMER'S ASSOCIATION; AMERICAN ASSOCIATION FOR CANCER RESEARCH; AMERICAN ASSOCIATION FOR DENTAL RESEARCH. Find addresses to write to the corporate offices or to the nonprofit chairperson in the Boycott Booklet or contact Stephanie Kemp. For additional information, click here. SPIN Groups connect St. Peter parishioners who share similar interests and hobbies. The groups are intended to provide non-ministry, social opportunities for members of St. Peter Catholic Church. Click here to sign up. 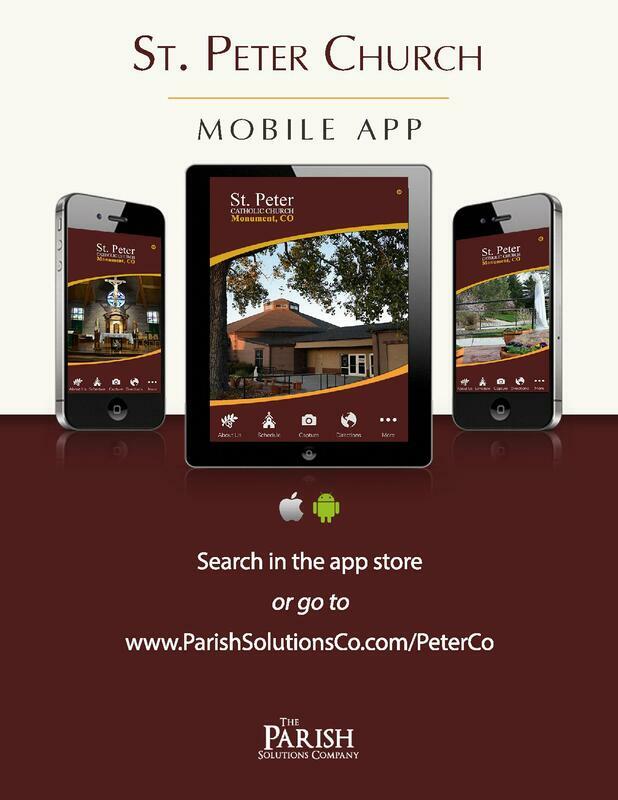 If you have questions or suggestions, contact St. Peter Parish Council member Rob Hickman. Are you discerning about being baptized or being initiated into the Catholic Church? Are you an adult who wants to complete their sacraments? If so, the Rite of Christian Initiation (RCIA) is the perfect place to not only grow in your relationship with God, but also learn more about the Catholic faith. If you are interested and ready to answer your call to discern the next step in your faith journey or just have questions about this process, please contact Teresa Crichton. Formal classes begin in September. In order to provide the safest environment possible for our children, and per the Diocese of Colorado Springs and the Bishop's Charter, all St. Peter volunteers are required to complete Safe Environment Training. The two-hour Foundational Training is for new volunteers and volunteers who have not viewed the video, Update Training is for all returning volunteers and lasts 30 minutes. Training is required for all pastors, priests, deacons, acolytes, principals, teachers, staff, choir members, hospitality ministers, ushers, greeters, and adults who have any contact with children or minors. Find the training schedule here. For more information, contact Julie Dickinson. We are grateful for our volunteers and sincerely appreciate your cooperation! In the last several months the Monument area has experienced a sharp increase in trespasses into vehicles, several residential burglaries, and four motor vehicle thefts. In almost all of these cases the vehicles were left unlocked in the driveway or street, or in a garage with the garage door open. One simple way to curb these crimes of opportunity is if everyone were to take very simple security precautions. First, always lock your vehicle. If you leave your car outside make sure that nothing of value is left in it (to include garage door remote control) and that no personal items can be seen simply by looking in the car. Make sure to always close your garage door at night and lock the passage door that leads from the garage into your residence. Finally, make sure that all windows and doors to your house are secured. These very simple precautions can help prevent you from becoming a victim. If we remove the opportunity we hope to eventually remove the attempts. ​To submit items for the bulletin, please contact Debby Dover. To submit information for publication on the website, please contact Lisa Hawthorne.